Perfect for Him. Perfect for Her. Everyone wants the perfect cozy sweater. One they can dress up or down. It should be simple enough for him, yet stylish and flattering for her. Rediscover the boyfriend sweater, a versatile garment that both guys and girls will fall head over heels for. Knitwear designer Bruce Weinstein has reinvented the classic boyfriend sweater with 19 ultra-comfortable projects designed to work on both men and women. Knit up a luxurious cardigan perfect for any important occasion, a varsity pullover with his-and-her initials, or one of four soft and sophisticated texture-rich scarves for you or him. Throughout, you’ll find tips to adapt each pattern, alter the proportions, and choose yarns to make the look more masculine or feminine. Plus, learn 19 knitting techniques you’ve always wanted to master, including brioche stitch, reversible cables, and Fair Isle, as well as seaming techniques to give your projects a professional finish. Whether you’re knitting for yourself or for the man in your life, these gorgeous projects are sure to be classics you’ll wear—or borrow—for years to come. 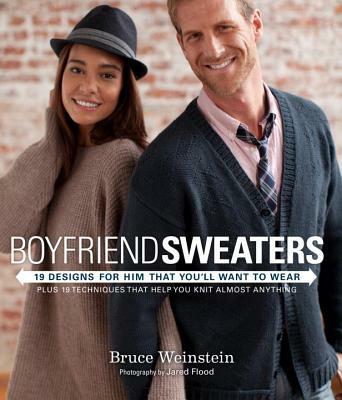 BRUCE WEINSTEIN is an expert on men’s knitwear, a knitwear designer, and the author of Knits Men Want. Bruce picked up the needles after a successful career as a chef and food writer with his partner, Mark Scarbrough, of sixteen years. They are award-winning and bestselling authors of more than twenty cookbooks. Visit Bruce at www.bruceandmark.com.